Crowns in ONE Visit — NO More Temporary Crowns!!!! Traditionally, making crowns can be both complicated and uncomfortable, with gooey impressions, multiple visits, and temporary crowns that can come off, leaving the tooth very sensitive. We are proud to be among the first in the Streator area to offer CROWNS IN A SINGLE VISIT using the breakthrough CEREC® technology. This process involves a computer making a detailed 3-D scan of your tooth, using it to craft a porcelain crown that is permanently bonded to your tooth in just one visit! While CEREC offers unrivaled convenience, perhaps an even more significant benefit is the long-lasting health benefit of receiving crowns in this manner. CEREC restorations are made with advanced ceramics that are the closest thing to human tooth enamel available. These restorations actually strengthen your teeth, avoiding the cracks, fractures, and splits that lead to so many future root canal treatments and extractions. These restorations save and protect as much good tooth enamel as possible — virtually re-enameling your tooth. Even with the convenience benefit and the health benefits, perhaps the benefit that puts the biggest smile on our patients is the way these restorations look compared to metal. We can’t wait to show you the difference! 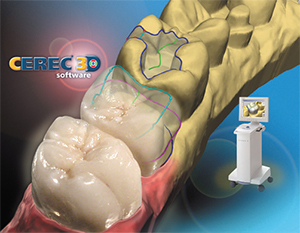 Call or email our office to learn more about CEREC - Crown in a Day.